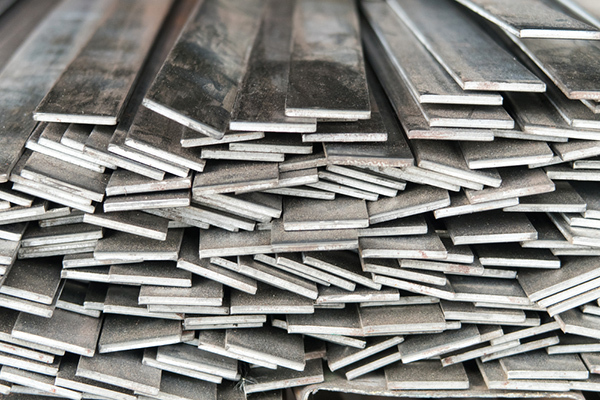 Our stainless flat bar products are divided into two primary groups – true flat bar and sheared and edged. A true flat bar is usually in the HRAP condition though it may sometimes be cold drawn. This bar has fairly sharp corners and tighter tolerances on thickness and width than sheared and edged and is often used by fabricators where the finished project is polished. Sheared and edged material is cut from plate, and then put through a process which straightens the bars and cleans up the edges. This is a much more cost effective way to buy a flat bar when corner sharpness and tolerances aren’t critical. The standard lengths of true bar are 12’-14’ random lengths, while sheared and edged bars typically come in 12′ dead lengths. Available Steel Grades: 304/304L, 316/316L, 303, 410, 416, 17-4 and more! True flat bar and sheared and edged options available. Cold drawn flat bar available in varying grades and sizes. DFARS or domestic material available in a wide range of sizes. FB-3/16″ x 1-1/4″ Stainless Steel Flat Bar	 3/16" x 1-1/4"
FB-3/16″ x 1-1/2″ Stainless Steel Flat Bar	 3/16" x 1-1/2"
FB-3/16″ x 1-3/4″ Stainless Steel Flat Bar	 3/16" x 1-3/4"
FB-3/16″ x 2″ Stainless Steel Flat Bar	 3/16" x 2"
FB-3/16″ x 2-1/2″ Stainless Steel Flat Bar	 3/16" x 2-1/2"
FB-3/16″ x 3″ Stainless Steel Flat Bar	 3/16" x 3"
FB-3/16″ x 4″ Stainless Steel Flat Bar	 3/16" x 4"
FB-3/16″ x 5″ Stainless Steel Flat Bar	 3/16" x 5"
FB-3/16″ x 6″ Stainless Steel Flat Bar	 3/16" x 6"
FB-1/4″ x 1/2″ Stainless Steel Flat Bar	 1/4" x 1/2"
FB-3/16″ x 1″ Stainless Steel Flat Bar	 3/16" x 1"
FB-3/16″ x 3/4″ Stainless Steel Flat Bar	 3/16" x 3/4"
FB-1/8″ x 3/4″ Stainless Steel Flat Bar	 1/8" x 3/4"
FB-1/8″ x 1″ Stainless Steel Flat Bar	 1/8" x 1"
FB-1/8″ x 1-1/4″ Stainless Steel Flat Bar	 1/8" x 1-1/4"
FB-1/8″ x 1-1/2″ Stainless Steel Flat Bar	 1/8" x 1-1/2"
FB-1/8″ x 2″ Stainless Steel Flat Bar	 1/8" x 2"
FB-1/8″ x 2-1/2″ Stainless Steel Flat Bar	 1/8" x 2-1/2"
FB-1/8″ x 3″ Stainless Steel Flat Bar	 1/8" x 3"
FB-1/8″ x 4″ Stainless Steel Flat Bar	 1/8" x 4"
FB-3/16″ x 1/2″ Stainless Steel Flat Bar	 3/16" x 1/2"
FB-3/16″ x 5/8″ Stainless Steel Flat Bar	 3/16" x 5/8"
FB-1/4″ x 5/8″ Stainless Steel Flat Bar	 1/4" x 5/8"
FB-1/4″ x 3/4″ Stainless Steel Flat Bar	 1/4" x 3/4"
FB-1/4″ x 1″ Stainless Steel Flat Bar	 1/4" x 1"
FB-5/16″ x 1-1/2″ Stainless Steel Flat Bar	 5/16" x 1-1/2"
FB-5/16″ x 2″ Stainless Steel Flat Bar	 5/16" x 2"
FB-3/8″ x 1/2″ Stainless Steel Flat Bar	 3/8" x 1/2"
FB-3/8″ x 3/4″ Stainless Steel Flat Bar	 3/8" x 3/4"
FB-3/8″ x 1″ Stainless Steel Flat Bar	 3/8" x 1"
FB-3/8″ x 1-1/4″ Stainless Steel Flat Bar	 3/8" x 1-1/4"
FB-3/8″ x 1-1/2″ Stainless Steel Flat Bar	 3/8" x 1-1/2"
FB-3/8″ x 1-3/4″ Stainless Steel Flat Bar	 3/8" x 1-3/4"
FB-3/8″ x 2″ Stainless Steel Flat Bar	 3/8" x 2"
FB-3/8″ x 2-1/4″ Stainless Steel Flat Bar	 3/8" x 2-1/4"
FB-5/16″ x 1″ Stainless Steel Flat Bar	 5/16" x 1"
FB-1/4″ x 6″ Stainless Steel Flat Bar	 1/4" x 6"
FB-1/4″ x 1-1/4″ Stainless Steel Flat Bar	 1/4" x 1-1/4"
FB-1/4″ x 1-1/2″ Stainless Steel Flat Bar	 1/4" x 1-1/2"
FB-1/4″ x 1-3/4″ Stainless Steel Flat Bar	 1/4" x 1-3/4"
FB-1/4″ x 2″ Stainless Steel Flat Bar	 1/4" x 2"
FB-1/4″ x 2-1/2″ Stainless Steel Flat Bar	 1/4" x 2-1/2"
FB-1/4″ x 3″ Stainless Steel Flat Bar	 1/4" x 3"
FB-1/4″ x 3-1/4″ Stainless Steel Flat Bar	 1/4" x 3-1/4"
FB-1/4″ x 3-1/2″ Stainless Steel Flat Bar	 1/4" x 3-1/2"
FB-1/4″ x 4″ Stainless Steel Flat Bar	 1/4" x 4"
FB-1/4″ x 5″ Stainless Steel Flat Bar	 1/4" x 5"
FB-3/8″ x 2-1/2″ Stainless Steel Flat Bar	 3/8" x 2-1/2"